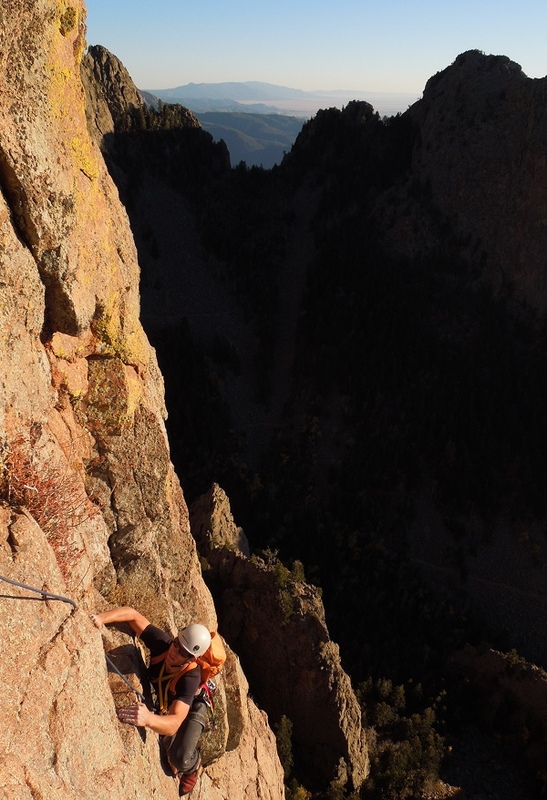 I've tried to do this route several times, but there have been parties on Mountain Momma and I refuse to climb long routes in the Sandias with potential trundlers above me. Yesterday was a perfect fall day, with cool temps and sun-warmed rock. Patrick atop the first pitch. 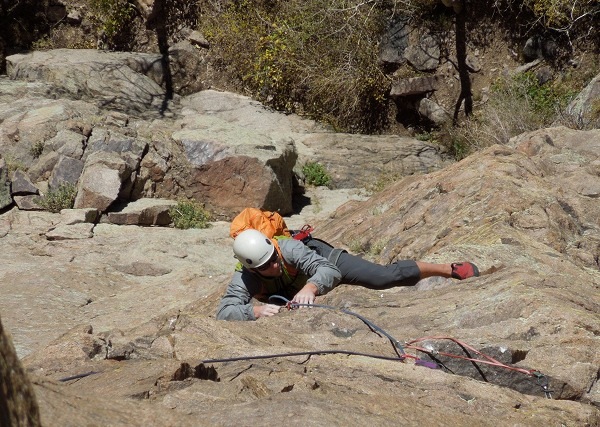 The second pitch begins with a difficult bolted crux, face climbing on crimpers. After that it felt serious. 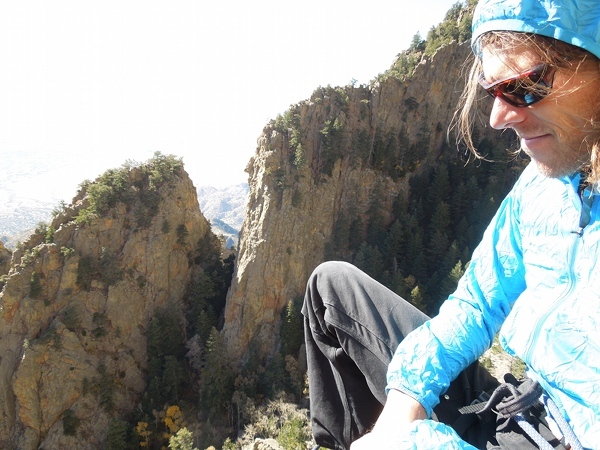 I got about 20 ft above the second bolt, looking at a factor >1 fall that would leave me lower than my belayer, then I was happy to see a perfect placement for a green C4 at my waist. Then it was into the land of thin face moves for 20 ft or so, no pro, with delicate balance around the arete to a rusty piton. Another 10 ft above the piton I was ecstatic to find a bomber #00 C3. 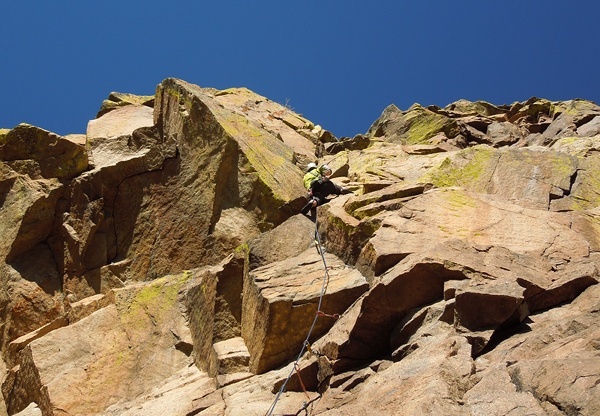 The next crux is a thin dihedral with burly lieback moves to an undercling at a roof. The instructions from there are "left then right again to the arete." I spent a long time finding my way to the arete, due to tenuous face moves and high uncertainty where the next protection might be found. Patrick moves into the face moves after the undercling. 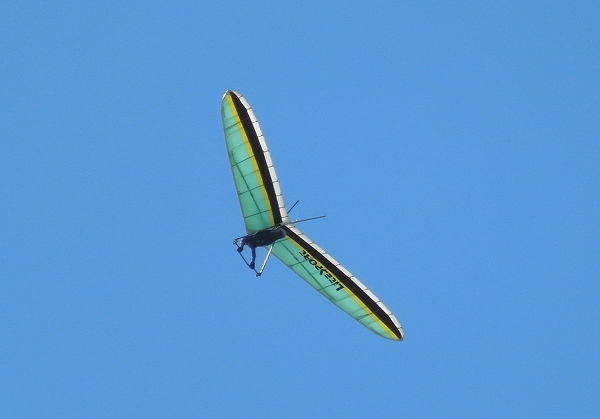 We cracked a beer on the ledge and watched a hang glider. I was happy to be alive and well. Patrick leads the next pitch. 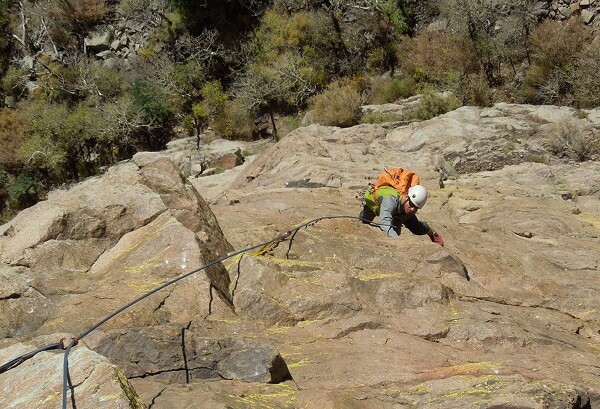 This one is classic and very special for the Sandias: not only is the climbing excellent, but the routefinding is obvious and protection is plentiful! Take plenty of small gear and I would even recommend this pitch as an alternative to the crux of Mountain Momma (which is visible on the right in the photo). 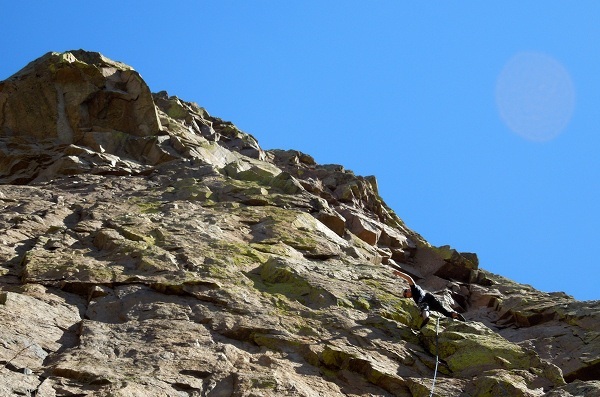 Patrick follows the Sandias special on the next pitch, 5.9 face climbing with scarce pro. That looks stellar. The potential factor >1 fall part made the hair stand up on the back of my neck. Hope you are doing well buddy.